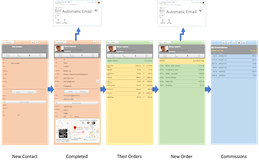 Modern database apps combine fingertip availability of all your data with easy workflow and can incorporate internet resources like maps, email and text messaging. A customized app can make your business more efficient and effective in managing your customer, inventory and order information, automating your production and business processes and giving you access to your data from your phone or tablet. Talk with us about creating a custom app for your organization and make your daily tasks a lot less effort and a lot more fun. Already have an App? We dust off a dingy database by incorporating new functionalities, clean up old code and give your app a fresh, user-friendly face. With our Filemaker database solutions you can track a customer from first contact through final payment. Manage your payments to commission-based recruiters. Automate email communications so they are timely and informative. Use the power of an app to always be on top of your customer interactions. 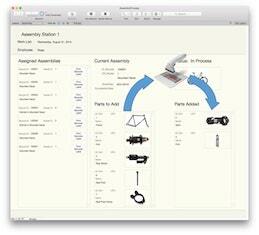 Manage an assembly process from ordering parts to shipping final product. We can help you be efficient when you go into the field by identifying all of the clients in a given area and plotting them in Google maps. Google will map out the best route, and you can visit them all in the least amount of time. 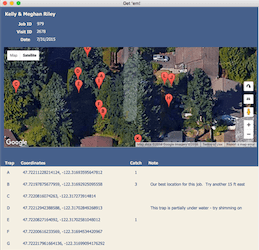 Use your app on a tablet in the field to see a satellite image of your current service call location. 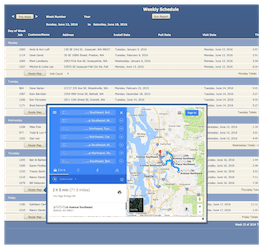 Use touch to plan and update location-based services. Contact Us to Begin Your Own Custom Database!